This article is about the current Irish body. For the historical legislatures, see Dáil Éireann (Irish Republic) and Dáil Éireann (Irish Free State). Dáil Éireann (/dɔɪl ˈɛərən/ ( listen) lit. Assembly of Ireland) is the lower house, and principal chamber, of the Oireachtas (Irish legislature), which also includes the President of Ireland and Seanad Éireann (the upper house). It currently consists of 158 members, known as Teachta Dála (plural Teachtaí Dála, commonly abbreviated as 'TDs'). TDs represent 40 constituencies, and are directly elected at least once every five years under the system of proportional representation by means of the single transferable vote (STV). Its powers are similar to those of lower houses under many other bicameral parliamentary systems and it is by far the dominant branch of the Oireachtas. Subject to the limits imposed by the Constitution of Ireland, it has power to pass any law it wishes, and to nominate and remove the Taoiseach (head of government). Since 1922, it has met in Leinster House in Dublin. The name Dáil Éireann is taken from the Irish language but is the official title of the body in both English and Irish, including both language versions of the Irish constitution. Since the Dáil was first established in 1919, it has also been described variously as a "National Assembly", a "Chamber of Deputies" and a "House of Representatives". A dáil means an assembly or parliament, so a literal translation of Dáil Éireann is "Assembly of Ireland". Article 15 of Ireland's constitution describes the body as "a House of Representatives to be called Dáil Éireann" (Teach Ionadóirí ar a dtugtar Dáil Éireann). In common usage, the word Dáil is accompanied by the definite article, but Dáil Éireann is not. So one speaks of "the Dáil" but not "the Dáil Éireann". The plural Dálaí is used when referring to the Dáil as constituted following different elections; for example, when referring to the First and Second Dálaí. Dáil Éireann has 158 members; the number has occasionally been changed within the limits of the Constitution of Ireland, which sets a minimum ratio of one member per 20,000 of the population, and a maximum of one per 30,000. Under current legislation, members are directly elected at least once in every five years by the people of Ireland under a system of proportional representation known as the single transferable vote. Membership of the Dáil is open to Irish citizens who are 21 or older. A member of the Dáil is known as a Teachta Dála, TD or Deputy. The Dáil electorate consists of Irish and British citizens over 18 years of age who are registered to vote in Ireland. Under the Constitution a general election for Dáil Éireann must occur once in every seven years, an earlier maximum of five years is set by the Electoral Act, 1992. The Taoiseach (head of government or prime minister) can, by making a request to the president, effectively dissolve the Dáil at any time, in which case a general election must occur within thirty days. The President may refuse to dissolve the Dáil, and ask the Dáil to form an alternative government without a general election taking place. The STV electoral system broadly produces proportional representation in the Dáil. 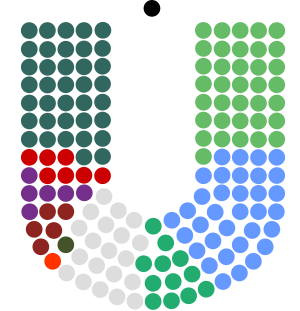 The small size of the constituencies used, however, usually gives a small advantage to the larger parties and under-represents smaller parties. Since the 1990s the norm in the state has been coalition governments. Prior to 1989, however, one-party government by the Fianna Fáil party was common. The multi-seat constituencies required by STV mean that candidates must often compete for election with others from the same party. This increases voter choice but is accused by some of producing TDs who are excessively parochial. Two failed attempts – 1959 and 1968 – have been made to change to the United Kingdom's plurality voting system ('first-past-the-post') electoral system. Both were rejected in referendums. By-elections occur under the alternative vote system. Currently every constituency elects between three and five TDs. The constitution specifies that no constituency may return fewer than three TDs but does not specify any upper limit to constituency magnitude. However, statute (Section 6 of the Electoral Act 1997) specifies a maximum of five seats per constituency. The constitution requires that constituency boundaries be reviewed at least once in every twelve years, so that boundaries may be redrawn to accommodate changes in population. Boundary changes are currently drafted by an independent commission, and its recommendations are usually followed. Malapportionment is forbidden by the constitution. Under the Constitution, the commission is required to refer to the most recent Census of Ireland when considering boundary changes. Under the Constitution of Ireland there must never be fewer than one TD for every thirty thousand of the population, nor more than one for every twenty thousand. In the 29th Dáil there was one TD for every 25,000 citizens, in line with many other European Union member state national parliament ratios with Malta having one MP for every 6,000 citizens and Spain having one MP for every 130,000 citizens. Ireland has a similar MP to Citizen ratio to Bulgaria, the Czech Republic, Denmark, Finland, Hungary, Latvia, Lithuania and Sweden. With the adoption of the current constitution in 1937 the membership of the Dáil was reduced from 153 to 138, but in the 1960s the number was increased to 144, then for the 1977 election to 148, only to be increased more substantially in 1981 to the figure of 166. The Electoral (Amendment) Act 2011 provides that the number of members "shall be not less than 153 and not more than 160". This came into effect at the 2016 general election. The Dáil chamber has confrontational benches but the end segment is curved to create a partial hemicycle. The government TDs sit on the Ceann Comhairle's left, with the main opposition party on his right. The Chamber was adapted for use as a Parliament from its former use as a lecture theatre. The First Dáil Éireann was established on 21 January 1919 as the single chamber parliament of the Irish Republic. One of the first actions of the Dáil was to ratify a constitution, commonly known as the Dáil Constitution. As a provisional constitution it made no reference to the length of the term of each Dáil. The first and second Dáil existed under the provisions of this constitution. Neither was recognised by the British government or the governments of other countries as the 'lawful' parliament of Ireland. Following the signing of the 1922 Anglo-Irish Treaty, which brought the Irish War of Independence to an end, the single chamber Dáil became the lower house of a new bicameral Oireachtas, the parliament of the newly established Irish Free State. Under the treaty, a new constitution replaced the 1919 Dáil constitution. Article 28 of the Constitution of the Irish Free State (1922) set the maximum term for the Dáil at four years. However, this constitution also provided for a mechanism which allowed the Oireachtas to ratify constitutional amendments by way of primary legislation, without the need for such amendments to first be approved by the Irish public in a referendum. This provision was to remain in effect for a period of eight years after the Free State constitution came into force (i.e. 6 December 1930). After that date constitutional amendments would require ratification by way of public referendum before they could come into force. In 1927 the Oireachtas enacted the Constitution (Amendment No 4) Act. This Act amended Article 28 of the Free State Constitution by extending the maximum term of Dáil Éireann from four years to six years "or such shorter period as may be fixed by legislation". Later that same year the Oireachtas also enacted the Electoral (Amendment) Act 1927 (No 21 of 1927). Section 7 of that Act stated that the "maximum duration of the Oireachtas without a dissolution shall be five years reckoned from the date of the first meeting of Dáil Éireann after the last previous dissolution". On 29 December 1937, the Irish Free State ceased to exist and was replaced by a new state called Ireland, with the coming into force of the new Constitution of Ireland. Article 16.5 of the 1937 constitution states that "Dáil Éireann shall not continue for a longer period than seven years from the date of its first meeting: a shorter period may be fixed by law". Despite this increase in the potential maximum term of the Dáil to seven years, Section 7 of the Electoral (Amendment) Act 1927 remained in force under the new constitution, as it applied to the term of the Dáil. As a result, the maximum term of the Dáil remained five years. Since the coming info force of the 1937 constitution, no Irish government has proposed changing the maximum term of the Dáil, which still remains five years. The acceptance of five years as the maximum term for any single Dáil was reconfirmed by section 33 of the Electoral Act 1992, which states "The same Dáil shall not continue for a longer period than five years from the date of its first meeting." Consequently, the maximum term for the Dáil is five years from the date it first met following the last general election. Article 16.3.2 of the Constitution of Ireland (1937) provides that an election for the membership of Dáil Éireann must take place not later than 30 days after a dissolution of the current Dáil. Article 16.4.2 of the constitution requires that the newly elected Dáil Éireann must convene no later than 30 days after the polling day for the election. As such, the maximum period of time between a dissolution of Dáil Éireann before a general election, and the meeting of the new Dáil, after a general election, is 60 days. The procedure and timetable for the dissolution of Dáil Éireann, pursuant to a general election, and the date for the reassembly of the newly elected Dáil, after the election, is set out in the Constitution of Ireland. Article 13.2.1 states that "Dáil Éireann shall be summoned and dissolved by the President on the advice of the Taoiseach". So the timing of a general election rests with the Taoiseach of the day. Once so advised by the Taoiseach, the President issues a proclamation which specifies the date on which the current Dáil is dissolved, and the date on which the newly elected Dáil must first meet. The timing for polling day in a general election is decided on by the Taoiseach. However, this is governed within a specified statutory framework. Once the Presidential proclamation is issued, the Minister for the Environment, Community and Local Government sets, by way of a ministerial order, the date and time of polling day in the election. (b) shall continue for such period, not being less than twelve hours, between the hours of 8 a.m. and 10.30 p.m. as may be fixed by the Minister by order, subject to the restriction that, in the case of a general election, he shall fix the same period for all constituencies. (2) An order under this section shall be published in the Iris Oifigiúil as soon as may be after it is made." For the purposes of the Act an "excluded day" means a day which is a Sunday, Good Friday or a day which is declared to be a public holiday by the Holidays (Employees) Act, 1973, or a day which by virtue of a statute or proclamation is a public holiday. So, if the Dáil were dissolved on a Tuesday 1 February (in a non-leap year), and the writs for elections issued by the Clerk of the Dáil on that day, then the earliest date for polling day would be Monday 21 February (17 days later, excluding Sundays) and the latest date for polling would be Wednesday 2 March (25 days after, excluding Sundays), with polling stations being open for a minimum 12-hour period between the hours of 8am and 10.30pm on polling day (as set out in the ministerial order). In such a scenario, the latest date by which the newly elected Dáil must assemble would be Wednesday 23 March (for a 21 February polling date), or Friday 1 April (for a 2 March polling date). The chairman, or presiding member, of Dáil Éireann is the Ceann Comhairle. The Ceann Comhairle is chosen from among TDs but is expected to observe strict impartiality. Despite this, the government will usually try to select one of its own for the position, if its numbers allow. To protect the neutrality of the chair, an incumbent Ceann Comhairle does not seek re-election as a TD but rather is deemed automatically to have been re-elected by their constituency at a general election, unless they are retiring. The Ceann Comhairle does not vote except in the event of a tie. The current serving Ceann Comhairle is Fianna Fáil TD Seán Ó Fearghaíl. While in principle Dáil Éireann is only one of three components of the Oireachtas, the other two being the President of Ireland and Seanad Éireann, in practice the powers the constitution grants to the Dáil render it by far the dominant branch, meaning that most bills passed by Dáil Éireann will ultimately become law. The President can only veto the bill if it is in conflict with the Constitution of Ireland. For this to happen, the President must refer the bill to the Supreme Court of Ireland to test its constitutionality upon consultation with the Council of State. In addition to its legislative role, it is the Dáil that designates the Taoiseach for referral to the President for appointment. The Dáil may also pass a motion of no confidence in the Government, in which case the Taoiseach must either seek a parliamentary dissolution or resign. 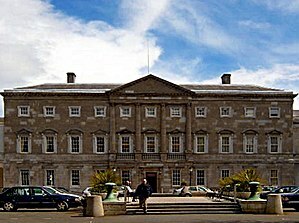 Leinster House in Dublin, seat of Dáil Éireann. Dáil Éireann determines its own standing orders and its members are protected by certain rights arising from parliamentary privilege. In line with other modern parliamentary systems, TDs do not generally vote in accordance with their consciences or the wishes of their constituents, but must follow the instructions of party whips, a practice that originated in the Irish Parliamentary Party. Except in exceptional circumstances, the Dáil meets in public. The Dáil currently has three standing committees and thirteen select committees. As of 2019, the Dail sits on Tuesdays, Wednesdays and Thursdays when the Oireachtas is sitting. On Tuesdays the Dail normally sits from 2.00pm until 11.00pm, on Wednesdays from 10.30am until around 11.30pm and on Thursdays from 10.30am until around 8.00pm. A typical day consists of questions to various cabinet ministers, Leaders questions whereby opposition Leaders ask the Taoiseach questions and routine debates on Bills. Every Tuesday and Wednesday three hours over the two days are given to the debate of opposition motions. These normally try to embarrass the government and are widely covered in the media. The government and its Majority normally amends these suitably and the amended version is passed by the Government. Debate and speeches are generally spoken in English, but it is still acceptable for TDs to switch back and forth between Irish and English. The Ceann Comhairle has ruled that it is disorderly for one deputy to describe another as a brat, buffoon, chancer, communist, corner boy, coward, fascist, gurrier, guttersnipe, hypocrite, rat, scumbag, scurrilous speaker or yahoo; or to insinuate that a TD is lying or drunk; or has violated the secrets of cabinet, or doctored an official report. Also, the reference to "handbagging", particularly with reference to a female member of the House, has been deemed to be unparliamentary. The Dáil maintains a document, Salient Rulings of the Chair which covers behaviour in and out of the House by TDs; section 428 of this lists unparliamentary speech. Firstly the Ceann Comhairle (or Deputy Ceann Comhairle) puts the question in Irish asking the TDs present to say Tá (Yes) or Níl (No) if they agree or disagree with the question before them. The Ceann Comhairle then gives his opinion as to the outcome of the voice vote. Deputies can challenge the Ceann Comhairle and demand a recorded vote by shouting Vótáil! (Vote!) The Ceann Comhairle then shouts 'Vótáil' again which starts the voting process. Division bells sound around Leinster House and in some of its adjoining buildings calling Deputies to the chamber to vote. The bells ring for six minutes and the doors to the chamber are locked after a further four minutes. The Ceann Comhairle then appoints two tellers for each side and Deputies are given one minute to vote. The vote is taken by electronic means whereby Deputies press either the Tá or Níl button on their desks to vote for or against a motion. After the voting time has concluded a sheet (Division Paper) containing the result and each TDs vote is signed by the four tellers and given to the Ceann Comhairle who declares the result. While electronic voting has become the norm the Dáil votes manually through the lobbies at the back of the chamber on a number of occasions, for example, motions of no confidence. A teller in an electronic vote can call a manual vote if they so wish. This has become an opposition tactic during important votes which are widely covered in the media. The first legislature to exist in Ireland was the Parliament of Ireland from 1297 to 1800, and the first legislative lower house was the House of Commons of this body. However the Parliament of Ireland was abolished under the Act of Union of 1800. Irish nationalists first convened Dáil Éireann as a revolutionary parliament in 1919 and while it successfully took over most functions of government it was not recognised under United Kingdom law. In 1921 the United Kingdom government established a legislature called the Parliament of Southern Ireland in an effort to appease nationalists by granting Ireland limited home rule. However this body was rejected and boycotted by nationalists whose allegiance remained with the Dáil. Nonetheless, because the First Dáil was illegal under the United Kingdom constitution, the lower house of the Parliament of Southern Ireland, the House of Commons of Southern Ireland, is considered in British legal theory as the precursor to the Dáil. The current Dáil derives from the 1937 Constitution of Ireland, but claims a direct line of descent from the 'First Dáil' of 1919. This Dáil was an assembly established by Sinn Féin MPs elected to the House of Commons of the United Kingdom in the 1918 United Kingdom general election. Upon winning a majority of Irish seats in the election (many uncontested), Sinn Féin MPs refused to recognise the United Kingdom parliament and instead convened as the First Dáil Éireann (translated as "Assembly of Ireland"): the unicameral legislature of a new notional Irish Republic, and the first Irish parliament to exist since 1801. The Dáil of the Irish Republic, however, was only recognised internationally by the Russian Soviet Federative Socialist Republic. The first meeting of the Dáil occurred in Dublin on 21 January 1919, in the Mansion House, attended by 27 members. The body was prohibited in the following September, and was forced underground, meeting in several locations. The Dáil of the Irish Republic was succeeded in 1922 by the Dáil of the Irish Free State. The Irish Free State, comprising the twenty-six southern and western counties of Ireland, was established under the 1921 Anglo-Irish Treaty. Dáil Éireann (now described as a "Chamber of Deputies") became the lower house of a new legislature called the Oireachtas. The first Dáil to exist under the Constitution of the Irish Free State succeeded the Second Dáil of the Irish Republic and so was styled the Third Dáil. The Third Dáil, and every subsequent Dáil, has met in Leinster House. The Constitution of Ireland, adopted in 1937, established the modern Irish state, referred to today as Ireland. Under the constitution a new legislature retained the title Oireachtas, and its lower house remained Dáil Éireann. The first Dáil to meet under the Constitution of Ireland was described as the Ninth Dáil. ^ "Dáil: definition of Dáil in Oxford dictionary (British & World English). Meaning, pronunciation and origin of the word". Oxford Language Dictionaries. Oxford University Press. 2013. Retrieved 30 November 2013. ^ a b Article 15.1.2° of the Constitution of Ireland reads: "The Oireachtas shall consist of the President and two Houses, viz. : a House of Representatives to be called Dáil Éireann and a Senate to be called Seanad Éireann." ^ "Irish Grammar Database: dáil". www.teanglann.ie. ^ "Electoral Act, 1992 – Part IX". Irish Statute Book. Retrieved 2 April 2013. ^ Citizens information. "Right to vote in Ireland". www.citizensinformation.ie. Retrieved 5 May 2017. ^ (eISB), electronic Irish Statute Book. "electronic Irish Statute Book (eISB)". www.irishstatutebook.ie. Retrieved 22 January 2017. ^ "Electoral (Amendment) Act 2011, Section 3". Office of the Attorney General of Ireland. 25 July 2011. Retrieved 11 January 2012. ^ (eISB), electronic Irish Statute Book. "electronic Irish Statute Book (eISB)". www.irishstatutebook.ie. ^ Salient Rulings of the Chair (2nd ed.). Dublin: Dáil Éireann. May 2002. §408. ^ "Dáil code: 'handbagging' not allowed". The Irish Times. 12 December 2009. Retrieved 13 December 2009. ^ "Dáil Debate Vol. 697 No. 5 "Social Welfare and Pensions (No. 2) Bill 2009: Committee and Remaining Stages." Personal Apology by Deputy". Houses of the Oireachtas. 11 December 2009. Retrieved 21 December 2009. ^ "Constitution of Ireland". Department of the Taoiseach. Retrieved 24 January 2011.